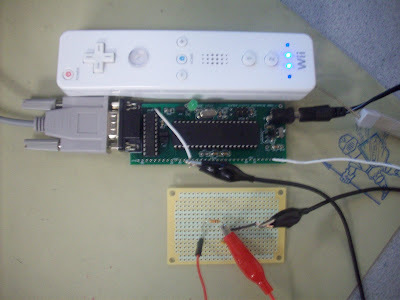 This AVR project is a simplified implementation of Wii-Music, utilizing a Nintendo Wii Remote (“Wiimote”) to play a gesture-based music game with the player as a virtual music conductor. The project exploited two of the Wiimote’s features: its wand-like shape and the embedded 3-D accelerometers. By interfacing between Microcontroller AVR ATmega 644 and Wiimote, the project able wirelessly transmit motion gestures and button pushes to the MCU. The MCU uses these inputs to create sound by means of Direct Digital Synthesis (DDS).